The cemetery itself is not visible from the dirt road. The grove of trees is visible from the US 75 access road. The first settlement in Collin County may have been Throckmorton, which was located here. The Throckmorton Cemetery was certainly the first public cemetery. The Throckmorton settlement was started by Governor Throckmorton's father, Dr. William Edward Throckmorton, in 1842. He died in 1843. The county of Throckmorton was named for them. A stockade was built around Throckmorton to protect the settlers from Indians. There are several accounts of the Indian raid on Christmas Day, 1842, when Mr. Whistler and Mr. Wesley Clements were killed. The accounts also say they were buried in Throckmorton Cemetery. The following year Dr. Calder was killed by the Indians and was buried next to them. There are no stones for any of them. Judging by the bois d'arc posts, this cemetery covers about 1 acre of land. The portion that has markers covers about 1/8 of that. The stones are on the east side of the grove of trees. 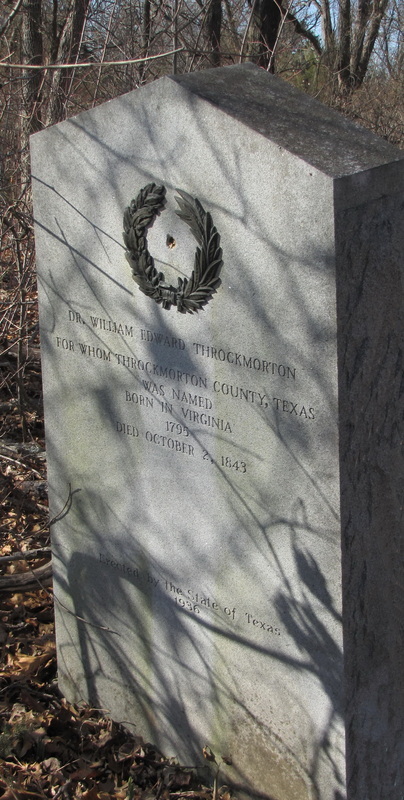 There is a large Texas-State stone marker for Dr. William Throckmorton. Governor James Webb Throckmorton is buried in Pecan Grove Memorial Park in McKinney. The cemetery is in the northeast corner of the W. E. Throckmorton survey. No deed has been found. The Sheriff's Department has cleared this cemetery in the past. They left piles of brush and trees lying around. The barbed wire fence is gone. Dr. Throckmorton's stone is the only Throckmorton stone in the cemetery. Governor Throckmorton married a Rattan. There is a large Rattan family plot. The cemetery is still watched over by the Rattans. I have heard that the Sheriff's Department returned in 1993 and put a fence around the cemetery. I have not been back to the cemetery to verify this. This cemetery was vandalized in the fall of 1995 along with the other cemeteries around Melissa. By Mrs. J. F. S.
On a Sunday afternoon we drove up to "Sunny Brook Farm" the home of Mr. And Mrs. W. C. Dysart, who live in a two-story house of seven rooms and basement, set in a grove of oak and pecan shade trees, two miles west of Melissa. Mr. and Mrs. Dysart "live at home and board at the same place" as indicated by the well-stocked basement filled with all kinds of canned vegetables, fruits and meats. A big ham weighing 40 pounds or more, was hanging from the rafters, and we visualized slices cut and fried, with plenty of red gravy, accompanied by a plate of fluffy White Billows hot biscuits. Crates of eggs and 85 pounds of honey were stored for ready use. The fig trees were loaded with luscious fruit and we were invited to gather all we wanted, and so the "Monday after, " a bowl of cereal topped with ripe figs was a "dish fit for the gods." The native pecan trees growing everywhere had been grafted to the big paper shell varieties, and the loaded trees promise a large yield. We glanced into the dining room and the festoons of hundreds of colored ribbons made us believe we had intruded on a planned party. On entering the room we discovered the ribbons were awards won by Mr. and Mrs. Dysart at the many fairs where they had exhibited their farm products for the last 14 years. The ribbons were not all blue ones, but the blues and reds predominated, and one blue ribbon carried a premium of $16. A historic grave yard, we had often heard, was located near the Dysart farm, and Mr. Dysart kindly took us to the site, a mile north, where the dust of many early pioneers and patriots lie. The plot of two acres, in the middle of a Johnson grass field which was set aside from the Dr. William E. Throckmorton homestead and near the family residence, for a burying ground is enclosed with a barbed wire fence. There are a hundred or more graves marked with neatly made slabs of bois d’arc placed at the head and foot, put there by Thomas Rattan, Jr., whose father, Thomas Rattan, settled nearby and he and his wife lie buried beside the graves of Dr. Throckmorton and wife. A daughter, Annie, became the wife of Governor J. W. Throckmorton. Mr. Thomas Rattan, Jr., was the father of Hamp and Jim Rattan, deceased, whose children still own the original tract settled in 1841 by the great grandfather. Mrs. John Mallow of Melissa is a daughter. Dr. Throckmorton, with several other families from Illinois, among them, Thomas Rattan, Hogan Witt and John M. Kincaid, came to Texas in 1841 and the homesteads were land grants from the Republic of Texas. Dr. Throckmorton was the father of Ex-Governor Throckmorton, our fellow townsman for many years, who, besides serving the state as governor, was elected to the state legislature in 1851, and served in the United States Congress from 1874-1879. Mrs. Jas. M. Wilcox, the mother of Judge Frank and Messrs. George and Joe Wilcox of our city, was a daughter of Dr. Throckmorton. A small plot fenced in pailings, contains the grave stones of Mr. and Mrs. Foster and daughter, Mrs. Charles Wysong, first wife of Charles Wysong, who died in 1855. A son, Dr. Jim Wysong, who settled at Hico, was a well known physician of that section of the state. Mr. Chas. H. Wysong later married Miss Bettie Slaughter of Melissa, and Dr. W. S. Wysong of McKinney and Hamp Wysong of Melissa are the sons of this union. Mr. Foster and wife immigrated from Missouri in 1849 and were among those who were bound for the gold fields of California, but after viewing the wide prairies and fertile soil of Texas decided to remain in Collin County. Mr. Price Foster and sister, Miss Grace, who reside on Wilcox Street, McKinney, are great grandchildren. They have in their possession a powder horn given their great-grandfather at the surrender of Lord Cornwallis at Yorktown, Va., in 1781. Mr. And Mrs. Foster, Sr., were among the children who left the shores of Britain on the Mayflower for the "Promise Land of America" in 1620. We were told that two marauding Indians were killed in the neighborhood, and some kindly hearted white man allowed the bodies to take their last long sleep among the other graves in the old cemetery. We want to think it was Dr. Throckmorton, for history records that his son, Governor Jas. W., was chairman of the Committee on Indian Affairs while in congress, and in 1865 was appointed to treat with the wild Indians on the border, and he made treaties with the friendly tribes of Commanches and Kiowas and others. Some people are still living here who remember the Blanket Braves from Indian Territory who made visits to McKinney to consult with him about some of their problems. A story told us when a child was as follows: An Indian and white man were seated on a log and the Indian kept saying to the white man, "Move over." The white man soon found himself ready to fall off and he cried, "What do you mean?" The Indian replied, "That is what the white man has done to the Indian." The grave of Dr. Throckmorton was located by a Catalpa tree growing at the head. A friend, at the funeral, 97 years ago, broke a twig from a tree and stuck it in the ground for a head stone. The twig grew into a tree of large proportions. Years after, a wind storm felled it to the ground. Another limb grew up from the root and is still standing. "Dr. William Edward Throckmorton, for whom Throckmorton County, Texas, was named, was born in Virginia, 1795; died October 2, 1843. Monument erected by the State of Texas in 1936." A bronze wreath surrounding a star adorns the monument at the top, indicating the Lone Star State as a Republic after gaining its independence April 21, 1836, at San Jacinto. Texas was admitted into the Union in 1845. We close this little sketch with lines from the immortal "Gray’s Elegy Written in a Country Church Yard:"
The bosom of his Father and his God." Sue Evelyn Rattan called last week to say that Sheriff Box’s S.C.O.R.E. program was that day clearing the overgrown Throckmorton Cemetery. This hallowed old spot is important to the history of Collin County because it was the very first place in the county to be settled. In 1841 Dr. William Throckmorton, his son James, who later became governor of Texas, and a party of six other men explored the wilderness that was to become Collin County, and were so impressed with the beauty of the area, they returned to Fort English to bring their families and establish a new home seven miles north of McKinney, off to the east of Hwy. 75. They erected a stockade to ward off Indian attacks, built cabins inside the tall fence, and established our first settlement in 1842. Dr. Throckmorton died the following year and young James was left to lead the settlement as well as to doctor their ills by using his father’s old medical journals. Young Pleasant Wilson was a moving force in keeping alive the new settlement by hunting in the great forests that covered much of the area and by fishing in the sparkling streams that were alive with many kinds of fish. Other settlers came to the area as soon as Peters Colony was a reality furnishing any man 640 acres of free land if he would settle here. All of Texas needed people, lots of people. Wagons were always pulling into the Throckmorton settlement in search of land. The women and children stayed safely in the stockade while the men rode all over the area in search of the best place to put down their roots. From this place the men and women who established Buckner three miles west of McKinney on Hwy 380 first came and lived while John McGarrah scouted the area before deciding to establish a trading post that became the first county seat of the county when it was established in 1846. Other settlers found homesteads all over what we now know as Collin County. When Texas was celebrating the 100th birthday, the governor had historical places marked with a plaque and a star. The grave of the first pioneer, Dr. William Throckmorton, was so honored. Thomas Rattan, born 1787, died 1854. Gillian Rattan, his wife, born 1782, died 1870. Jane Foster, born 1805, died 1881. 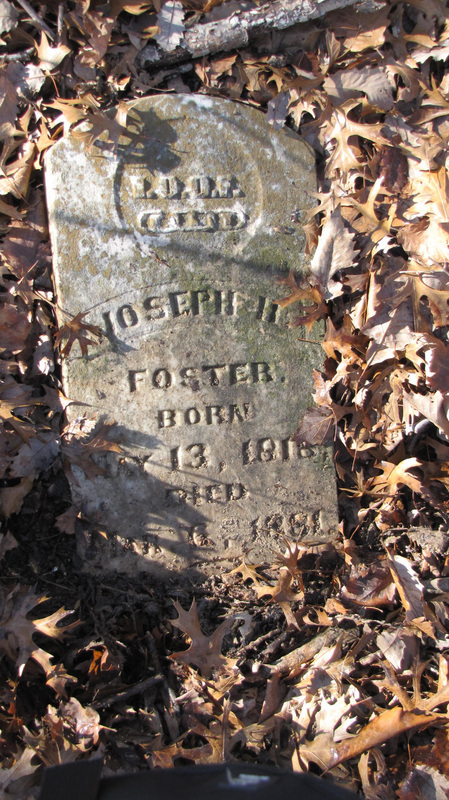 Joseph Foster, born 1818, died 1881. Nancy Foster, born 1820, died 1892. Sally Foster, born 1777, died 1858. Jeremiah Vardaman, born 1797, died 1854. Sarah Wysong, born 1815, died 1854, along with her 2-day old son. Dr. William Throckmorton, born 1795, died 1843. Thorckmorton settlement was not only the FIRST in the county, but is located in one of the prettiest sections we have.